In 2017, there were 611 IIASA publications, of which 396 were peer-reviewed journal articles. These articles were written in collaboration with over 1,600 coauthors from 159 institutions in 65 countries and regions. IIASA has a Scientific Publications Policy that encourages the widest possible dissemination of work done by its researchers. In 2016, IIASA also introduced an open access policy to make all publications freely available via its publications repository (PURE). The policy requires that all IIASA authors deposit a complete version of their peer-reviewed research articles in the IIASA institutional repository, to ensure that it is freely accessible within a year of the online publication date. This can either be the published version of the paper (known as gold open access), or the accepted version of the paper (known as green open access). During 2017, the IIASA Library negotiated an agreement with the Taylor & Francis Group to facilitate access and additional open access publishing at no extra cost. This is one of several agreements with publishers that allow for a discount on article processing charges, or enable open access publishing without additional costs for authors affiliated with IIASA. Agreements with MDPI, for example, allow authors to publish at discounted charges, while IIASA’s agreement with Springer, which has been in place since 2016, allows corresponding authors affiliated with IIASA to publish open access at no extra cost. These agreements have enabled the publication of over 50 open access articles. In addition to the above, a new ‘read & publish’ agreement was negotiated with Wiley during 2017. This agreement, which will be effective as of 2018, grants access to not only journals, but also to unlimited open access publications in hybrid journals at no extra cost. Because IIASA encourages its researchers to publish their research in journal articles or books that are available free of charge to all users (gold open access), it has established a fund for covering open access fees. In 2017, this fund was made available to researchers to partially cover publication costs if no other grant is available. This facilitated the publication of 27 articles through gold open access. Of the 396 journal articles published in 2017, 242 have publicly available full text in PURE. A total of 80 full texts are currently still under embargo (34 for 12 months or less), and 74 entries have no paper attached. 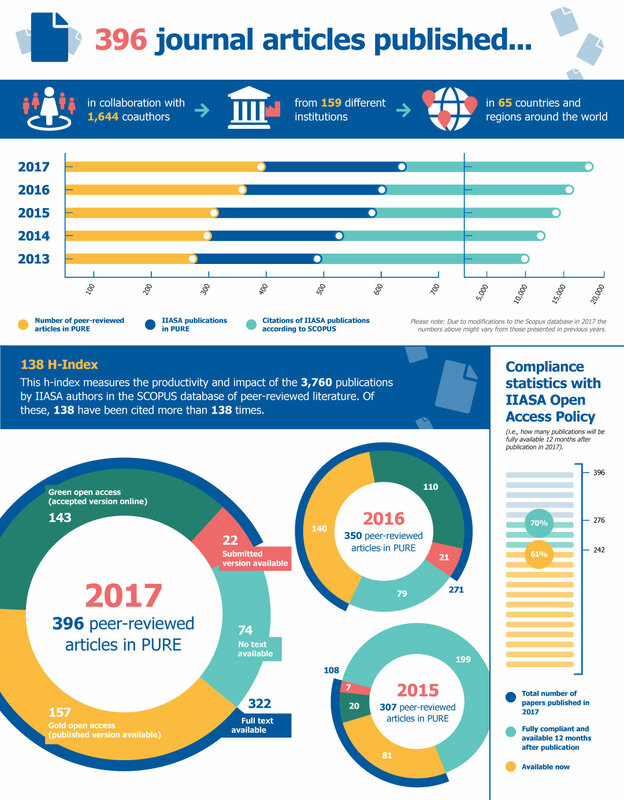 As of January 2018, compliance to the IIASA Open Access Policy in 2017 was 70%. An increase in this rate is foreseen for 2018. In 2017 there were 252,129 downloads from PURE, compared to 87,900 between March and December 2016 (the repository only went live in March 2016). Apart from increasing the visibility of IIASA research, PURE also facilitates the linking of all publications related to a specific project to improve reporting to funders, the tracking of research output, and the aggregation of content that feed into aggregating services like OpenAIRE. In addition to the traditional metrics currently used in academia to determine research impact, the Altmetrics widget included in PURE monitors mentions of IIASA publications in news outlets and social media, and has become a popular tool for supplementary information on the performance of individual publications. During 2017, work also began on updating the Scientific Publications Policy and Copyright Policy to bring them in line with current practices. The open access to data taskforce was set up to conduct an analysis of the current status of open access to data, research tools and models at IIASA, along with future options for discussion by the Council. In 2017, the taskforce produced an inventory of all datasets, software, tools, and models available at IIASA with links for accessing them, as well as further links to relevant publications and other related projects. This inventory was provided to the Council in June 2017 and followed up with an updated version in November 2017. Based on the software used for the publications repository (PURE), work on establishing an IIASA Data Repository started in 2017. A prototype was set up and tested internally, after which the library team began populating it. A live implementation along with a Research Data Management Policy – which was drafted in 2017 and is currently under internal review – is planned for 2018.